WiseNet HD+ IR Bullet cameras allow users to upgrade their surveillance systems to HD using legacy coax cabling without the costly process of ripping and replacing coax with Ethernet cabling. The new WiseNet HD+ cameras offer a variety of high-performance features including Day/Night operation, motion detection, defog, IR illuminators and more depending on model. Models include box, indoor dome, outdoor vandal dome, and outdoor bullet. Setup functions are easily controlled by OSD with the built-in joystick or control over coaxial cable with WiseNet HD+ DVRs. Low power consumption, compact form factors, and transmission up to 1,640 feet further enhance the lineup. 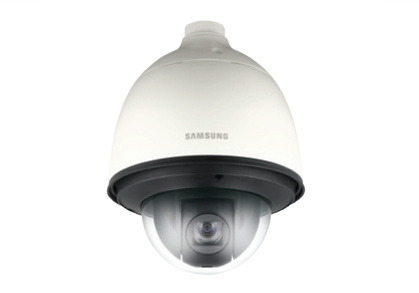 The HCP-6320HA PTZ dome is an outdoor PTZ dome that features a 32x auto focus zoom lens with low light level capabilities of 0.03 Lux Color. Up to 2MP resolution over Coax, The PTZ has full 360° capability, 700° per second pan speed, and 255 presets, True WDR (120dB), and VPS (Virtual Progressive Scan). The HCP-6320HA is compatible with a range of control protocols via both RS-485 only, IP66, IK10 rated. Requires a RS-485 data cable for control of the PTZ movements. Requires 24VAC power - 65VA. An added benefit of these AHD cameras is that they will also work with older analog DVRs!